Today's VetGirl guest blog is written by Dr. Joan Regan, DACVR, from Angell Animal Medical Center on PennHIP! 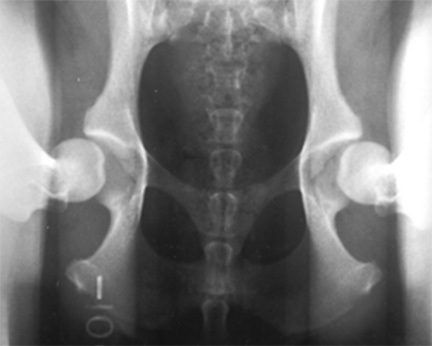 The Penn Hip Improvement Program is a radiographic method for evaluating canine hip joints. This technique assesses hips for conformation and evidence of degenerative joint disease and also measures the laxity in each joint. This method has proven more accurate than others available in its ability to predict the likely onset of osteoarthritis (OA or DJD) which is the hallmark of canine hip dysplasia (CHD). The program also includes a network of veterinarians trained to take the specific radiographic views required and a large and growing database of breed-specific information. The information gathered is used to answer questions about the etiology and genetic basis of HD and is published regularly. Developed at the University of Pennsylvania’s School of Veterinary Medicine by Gail Smith, VMD, PhD, the program was based at the university from its inception until last year. At the end of 2013, however, PennHIP was acquired by Antech Imaging Services (AIS) and has recently moved to new offices outside the university. AIS plans to market the program more widely and streamline the reporting process, but the mission of the program remains the same: to develop and apply evidence-based technology to direct appropriate breeding strategies aimed at reducing OA due to CHD when used as a selection criterion. The connection between hip joint laxity and CHD has been noted in the veterinary literature since the 1960s. The general consensus is that CHD is a heritable, developmental disease manifested as hip joint laxity that leads to the development of OA. Since dogs are not born with OA but develop it over time, identifying affected dogs by radiographs alone is not always possible at an early age, before they are used in breeding programs. Before PennHIP, the standard image for evaluating the hips was a “hip-extended” VD radiograph of the dog’s pelvis, done with the dog under sedation. Dogs could be evaluated at one year of age, but could not be officially certified until they were two years old. This view will demonstrate any significant subluxation or degenerative changes that may be present, but more subtle abnormalities may be obscured because the extended positioning, with its accompanying tightening of the joint capsule, shows the hips to best advantage. Breeding based on this view alone has resulted in some progress in the reduction of the disease, but it has been slow. The PennHIP method makes use of the extended VD view but also requires two additional, specialized views taken to assess the passive laxity of each hip and can be done on puppies as young as 16 weeks. Functional laxity of any joint is the result of the conformation and condition of the joint as well as the effect of the muscles that act upon it when the dog is awake and walking on the joint. Unfortunately, it is not possible to measure functional laxity in dogs. Passive laxity, or the looseness of the same joint when the dog is heavily sedated or anesthetized, can be measured. Applying his mechanical engineering expertise to the problem, Dr. Smith used cadaver pelves of dogs to devise a measurement of passive joint laxity which is called a distraction index (DI). To arrive at this measurement in a heavily sedated or anesthetized dog, the hip joints are radiographed in maximum compression and again in maximum distraction. The distance that the center of the femoral head moves out of the acetabulum from one view to the next is then calculated. This number is divided by the radius of the femoral head. These calculations are all done by the PennHIP organization on the radiographs they receive from participating veterinarians and the result is a unitless number between 0 and 1.0. The lower numbers indicate tighter hips and the larger ones, increasing looseness. There is no “passing” or “failing” number, just an objective assessment of how much the femoral head can move laterally relative to the acetabulum within the joint capsule. Initial measurements on a large population of dogs revealed that individuals with a DI or .3 or less did not develop OA over time whereas dogs with higher DIs could develop OA as they aged and that higher DI numbers made this increasingly likely. This observation has been borne out over time by measurements on a variety of breeds. Greyhounds and Borzois, for example, selected over generations of dogs for their ability to run, rarely show DI numbers greater than .2 to .3 and do not develop OA as a result of laxity. On the other end of the spectrum, breeds not selectively bred for speed, but for other qualities, such as Golden Retrievers, have higher DI numbers and show more OA changes as they age. An increased DI is thus a risk factor for the development of OA over time. The PennHIP database lists the range and average DI by breed, once enough individuals of that breed have been tested to make the numbers meaningful. Workshops for certification of interested practitioners are conducted by Dr. Gail Smith and his colleagues several times a year, usually at national veterinary meetings. The compression and distraction views must be done in a way that is consistent and reproducible in order for the measurements done on them to be reliable. The training consists of 7 hours of lecture and workshops over the course of a day. After taking the course, veterinarians who want to become certified must submit multiples of each view – extended VD, compression and distraction – on each of 5 dogs which will be evaluated for consistency. If the latter two views are done properly, the measurements should be virtually the same each time. The other condition for certification is that all images taken must be submitted. A veterinarian cannot decide after taking the extended view and seeing advanced degenerative changes that it’s not worth going on. If obviously affected individuals are excluded from the database, the full range of the problem in the breed cannot be determined. How is the DI used? As stated initially, the aim of this program is “to develop and apply evidence-based technology to direct appropriate breeding strategies aimed at reducing in frequency and severity the osteoarthritis of canine hip dysplasia.” Since the measurements can be done on puppies as young as 16 weeks, breeders can use the information to inform their breeding decisions. Breeders working with PennHIP have improved the average tightness of their dogs’ hips over time by breeding only dogs with “tighter” hips, as determined by lower DI numbers. How “tightness” is defined will vary by breed and depend on how many individuals of that breed are affected by CHD. If a large percentage of individuals in a breed are affected, then too stringent a selection would result in a decreased genetic diversity in the breeding population. In these breeds, more moderate selective pressure makes more sense. Dogs not destined to be bred are often tested and the results entered into the PennHIP database at the request of their breeder, in order to increase the amount of information about a particular breeding line. 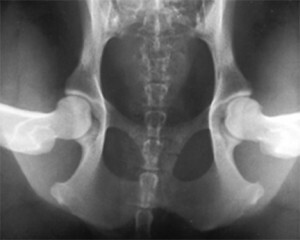 The Penn Hip Improvement Program is a radiographic method for evaluating canine hip joints. This technique assesses hips for conformation and evidence of degenerative joint disease and also measures the laxity in each joint. This method has proven more accurate than others available in its ability to predict the likely onset of osteoarthritis (OA or DJD) which is the hallmark of canine hip dysplasia (CHD). The program also includes a network of veterinarians trained to take the specific radiographic views required and a large and growing database of breed-specific information. The information gathered is used to answer questions about the etiology and genetic basis of HD and is published regularly. Developed at the University of Pennsylvania’s School of Veterinary Medicine by Gail Smith, VMD, PhD, the program was based at the university from its inception until last year. At the end of 2013, however, PennHIP was acquired by Antech Imaging Services (AIS) and has recently moved to new offices outside the university. AIS plans to market the program more widely and streamline the reporting process, but the mission of the program remains the same: to develop and apply evidence-based technology to direct appropriate breeding strategies aimed at reducing OA due to CHD when used as a selection criterion.